To make the base, stir all of the ingredients together in a large bowl. Press the crumb mixture into 12 shot glasses. Set aside. 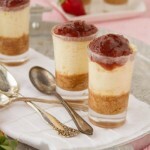 To make the cheesecake filling, add all ingredients to the bowl of your food processor, blender or stand mixer. Mix until smooth. Evenly divide the filling into the shot glasses. Place glasses on a baking sheet and slide into the preheated oven. Bake for 30 to 35 minutes. If the cheesecake starts to color, tent the glasses with aluminum foil. 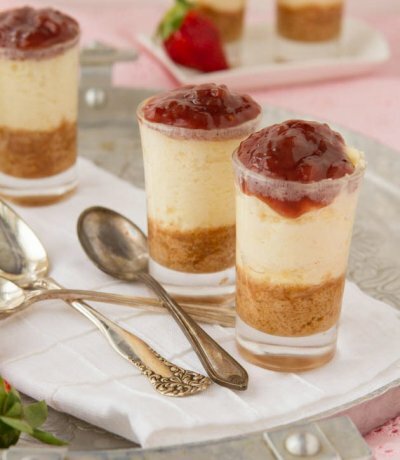 When baking, the cheesecake may push out from the tops of the shot glasses, going far beyond the rim. Don’t worry; they will settle when they’re out of the oven. Remove the cheesecake from the oven and let it cool completely. Cover and refrigerate overnight. When you’re ready to serve, top with a dollop of strawberry jam or spread.